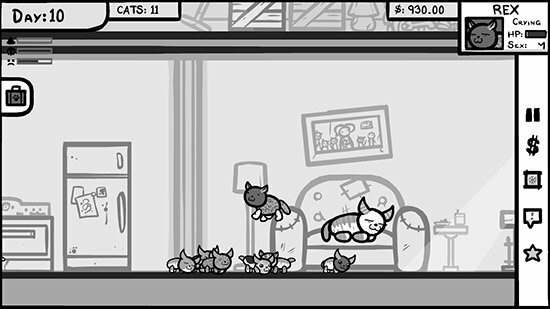 Team Meat Reveals That Mew-Genics Is A "Cat Lady Sim"
After 17 weeks of teasers that barely scratched the surface of what Mew-Genics is really about, Team Meat has finally pulled back the curtain on their game about cats to reveal that it is basically a strange (and at times sad) “Cat Lady Sim”. 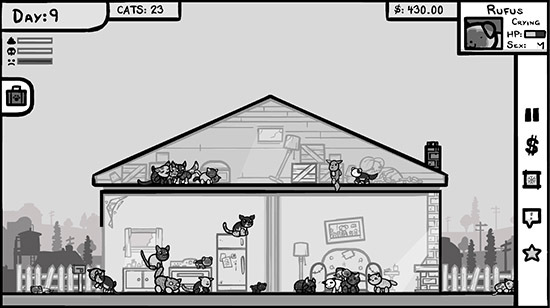 Edmund McMillen, Mew-Genics‘ co-creator, explained on Team Meat’s blog that the game pulls in different gameplay elements from The Sims, Pokemon, Animal Crossing and “a dash of Tamagotchi”. On the surface that sounds fairly tame, however, his further description of Mew-Genics reveals that the cat breeding sim is very complex and creates an environment where “consequences actually mean something”. Instead of just laying out a description of the how the game works, McMillen opted to explain Mew-Genics by telling a short story of one of his play sessions — which didn’t exactly have the happiest of endings. The story starts with McMillen thawing a “fat female cat” named Puddle from her Cryo-cube and placing her inside the house. Puddle had recently taken 2nd place in one of the game’s cat pageants, due to her unique “forked tail”, and she needed to breed so that the winning trait would not die out with her bloodline. A male cat was introduced to Puddle, however, she didn’t like him and kicked him in the face while he was trying to eat. Sadly, that cat ended up with an eating disorder from the head kick and eventually starved to death in the attic of the house. Not long after that, a black stray male walked by who seemed like a perfect match for Puddle. The pair hit it off and before long Puddle ended up pregnant, and up in the attic for safe-keeping with her two new kittens. It was then that the stray male revealed that he was a bit of a narcoleptic and refused to wake up, which was a trait that he ended up passing on to both of Puddle’s kittens. Additionally, whenever he was awake he was aggressive towards the kittens, so he eventually was booted from the house and sent on his way. The kittens grew up and one of them ended up with the prized “forked tail”. That kitten was entered into the pageant, but he fell asleep on stage and didn’t rank anywhere near as high as his mother. On top of the disappointing offspring, Dr. Beanies then discovered that Puddle had caught “feline aids” from the stray male. McMillen didn’t have enough money to purchase a treatment from Dr. Beanies, so she ended up going back into the Cryo-cube, with the hope that enough money could be earned to cure her. It was at that point that a local animal control officer arrested McMillen for kicking out the stray, letting Puddle get feline aids, and having a dead cat in the attic. The post adds that the short story barely scratches the surface of the mechanics involved in game, but the end goal for the title is to “create a living world where cats act like cats and the player as well as the cat’s actions actually matter.” Based on that story, I would say mission accomplished. Mew-Genics still does not have a specific release date, however, it is expected to launch sometime this year on Steam, iOS, Android, and “possibly more”. We will keep an eye out for any additional updates on Mew-Genics, and let you know as soon as anything is announced. In the meantime, make sure to let us know your thoughts on the upcoming “Cat Lady Sim” in the comments below.